Here’s an example of two phylogenetic trees. The tree on the left was used as part of an assessment in an advanced university course in Evolutionary Genetics. Its purpose was to test students understanding of how to interpret a phylogenetic tree. 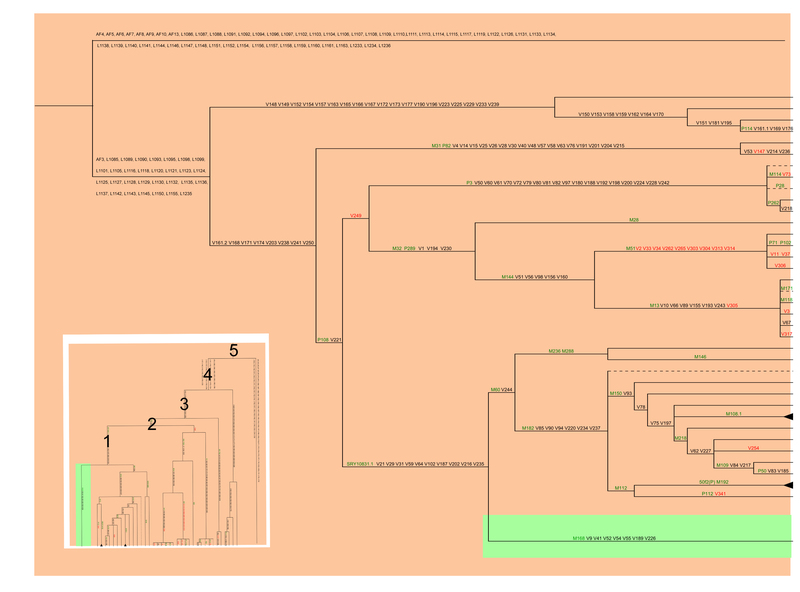 This example demonstrates how to interpret the geographical origin of a group of organisms from a phylogenetic tree. 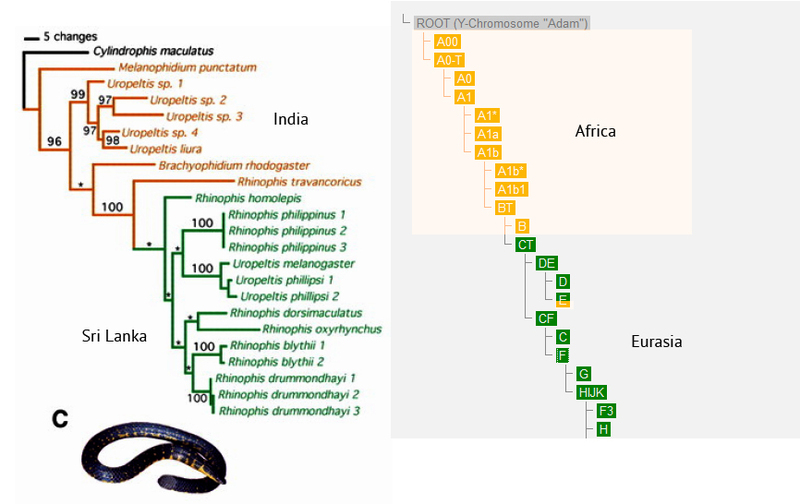 The correct interpretation is that this group of snakes originated in India, and the subgroup which is found in Sri Lanka is derived from just one of the nested clade divisions from the full phylogeny in India. All the earlier tree bifurcations occur in India. Clearly the group of taxa originated in India. The tree to the right is structured very similarly. All the earlier tree bifurcations occur in Africa. The subgroup which is found in Eurasia is derived from just one of the nested clade divisions from the full phylogeny in Africa. All the earlier tree bifurcations occurred in Africa. Clearly the group of taxa originated in Africa. EDIT: It is apparent that in the example above, the tree to the right didn’t adequately represent the point I was attempting to make. Below is an alternate version which doesn’t confuse taxonomic labels v’s phylogeny. Note: for greater clarity,.. the CT node has been collapsed. To put the phylogeny into easy to understand terms, lets flip the tree on its side (see inset to bottom left of diagram) and imagine we are looking at a family tree. If CT is one brother, then the lineage characterised by M60 is its brother, and “1” represents their father. Their grandfather is number 2. The other descendants of “2” are cousins to CT and M60. If we go up another generation, their great grandfather is “3”. The other extant descendants of “3” are second cousins to CT and M60. If we go up yet another generation, their great great grandfather is “4”. The other extant descendants of “4” are third cousins to CT and M60… If we go up yet another generation, their great great great grandfather is “5”. The other extant descendants of “5” are fourth cousins to CT and M60. Lets say that CT lives in New Zealand and M60 lives in England. Was their father “1” from England and CT later migrated to New Zealand, or was their father from New Zealand and did M60 later migrate to England?. If all their cousins, (& all their second cousins, all their third cousins, and all their fourth cousins), are in England then is it more likely that CT migrated from England to New Zealand, or is it more likely that all the descendants of “5” migrated from England to New Zealand, with only a single descendant remaining in New Zealand. Angela, will you comment on D/E? I sent you email last night however this morning I am thinking it might have hit your spam box. Thanks in advance. Thank you very much for this information!. The geographical location of the Ancestor of DE is currently unresolved as one branch is found in Asia, and one branch is found in Africa. D and E are effectively brothers, and from them alone we cannot say for sure whether D migrated from Africa to Asia, or E migrated from Asia to Africa. It’s from lineages such as your cousins that debates like this can get resolved. Your cousin who is DE, is from a lineage that is effectively cousin to both D and E. Lineages like your cousins are very important and very valuable.